Back in 2004 I was researching the stories behind the men who were hanged at the old Petrie Terrace prison during the mid-19th century and then buried in Toowong Cemetery. This work was all going down the usual path of visits to the archives and libraries to trawl through microform records and old books, when one case jumped out and took me on an unexpected and rather gruesome tangent. It involved a Russian scientist, a Chinese murderer, a Sydney museum, a wild goose chase, and a head in a jar. 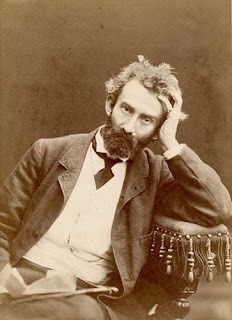 Four executions took place in Brisbane during the winter of 1880, and a notable element of these events was the presence of the famed Russian anthropologist Nikolai Mikhoulo-Maclay, nicknamed ‘the Moon Man’. He was studying the comparative anatomy of the brains of various races in order to determine their comparative intellectual capacities. His conclusions were at odds with most contemporary opinions, as he found that the ‘cerebral-neural equipment’ of different races were identical and so there "was nothing to justify the concept of higher and lower races". Through his own work, Mikhoulo-Maclay became a strong advocate of the rights of Indigenous peoples. Mikhoulo-Maclay had intended staying in Brisbane for just a few days en route to Sydney, but ended up staying for a few months after being given unexpected access to a laboratory, photographic equipment, and some ‘interesting specimens’ to examine - namely, the bodies of the four men hanged in Brisbane that winter. With colonial Queensland being as multi-racial as it was, these were a Caucasian, a Chinese man, a Filipino, and an Aboriginal man. And with colonial Queensland being as scientifically curious as it was, Mikhoulo-Maclay was allowed to remove and photograph their brains immediately after death. This was all fascinating stuff, especially the case of the Aboriginal man, Kagariu, also known as Johnny Campbell, ‘the black Ned Kelly’. 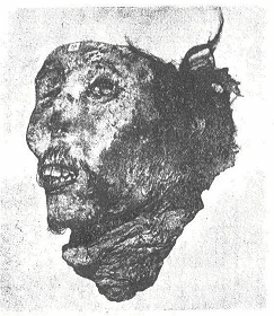 I will probably write more here at a later date about the bizarre journey that Kagariu’s body took after his death, but the story that involved a lot more digging than I expected was that of the Chinese man, thirty-something Jimmy Ah Sue. Ah Sue had been sentenced to death for the murder of a fellow gardener at Nuggety Creek, near Copperfield. He had beaten the man to death after an argument over stolen rice, and so was hanged one May morning in 1880 in a Petrie Terrace prison yard alongside James Ellesdale, another murderer. After the event their bodies were handed over to Mikhoulo-Maclay, who neatly removed the tops of the skulls and took out the brains for examination. What happened next was revealed when I read Frank Greensop’s 1944 biography of Mikhoulo-Maclay, Who Travels Alone. Greensop wrote of visiting the storage rooms at the Macleay Museum at the University of Sydney and seeing two heads stored in jars on a cupboard shelf. He noted that the flesh, skin and hair were still “firmly attached”. The tops of the skulls had been neatly removed and, although they had been embalmed, the heads were not kept in preservative fluid. Greensop identified one of the heads as belonging to Jimmy Ah Sue, while the other seemed likely to be the Filipino man (Maximus Gomez). Mikhoulo-Maclay had donated the heads to the museum back in 1890. I wondered if it was possible that these heads were still there, so I wrote to the museum and asked. It turned out that they were indeed still there, in a special store with restricted access. As I had traced the grave sites of the 23 executed prisoners in Toowong Cemetery, it occurred to me that perhaps the heads did not belong in a jar on a shelf but rather in the graves with the other remains. Given that the identification of Gomez was uncertain, I asked if it was possible for the head of Ah Sue to be repatriated, and was informed that I would need to contact Ah Sue’s descendants and then the museum staff would “consider their wishes in regards to the remains”. Tracking down the descendants of an unhonoured ancestor born somewhere in China, sometime around the 1840s, was, as you might imagine, a daunting task. I tried to get help from the Chinese Embassy but none was forthcoming. 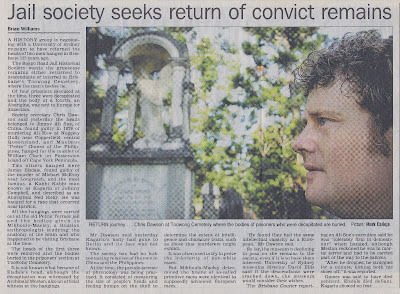 The Boggo Road Gaol Historical Society made an enquiry here and there, and we got a story in the Courier-Mail, but quite frankly we could have thrown the entire resources of 'Who Do You Think You Are?' at this and still got nowhere. Not having the rest of my life to dedicate to the task, I gave up and so the descendants remained unfound, the heads still sit on a shelf in Sydney, and whatever is left of the rest of their bodies are in Toowong Cemetery. But who knows, maybe by some billion-to-one shot a descendant of Ah Sue will read this. Or maybe the museum will have a change of policy. Either way, I'm not holding my breath.